Pump Track Nation is alive and well with the newly constructed Stevie Smith Memorial Park Pump Track. Throughout August 2017, Velosolutions teamed up with the Stevie Smith Legacy Fund to being this park to a reality in Nanaimo, Vancouver Island. 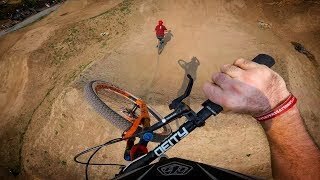 Check out the video for a behind the scenes look at what it took for Velosolutions to make this track happen for the opening day ride. Velosolutions brings us uniquely designed tracks catering to beginners and professionals, using an asphalt technique as being the most sustainable solution on the market. This design type allows for a great mix of rides to take advantage of the rollers, jumps, and berms, including BMX, dirt jump bikes, slopestyle bikes, skateboards, scooters, and even full suspension bikes. Basic skills such as balance and coordination that can cross over into multiple sporting disciplines. Places such as Levenworth, Pretoria South Africa, Oklahoma, Poland and Crankworx Rotorua, New York City, Manila, Thailand, to name a few, Pump tracks provide the opportunity for communities to be innovative and promote a healthy, active outdoor lifestyle. Most important, Pump Tracks are fun.